Top of the line production crew from sound.com and Star Dimension along with the system engineering support from Harman Professional India together delivered the most spectacular sensory experience ever at The Purpose World Tour India edition – a worldwide production by Canadian Singer Justin Bieber. For the concert, the venue was deployed with a complete Harman PA solution with JBL VTX V25II used for the main powered by Crown amplifier T12000HD, Flown subwoofers VTX S28, ground Subs VTX G28, Front fills – VTX V20, Side fills LR – VT4888, Delay LR and Outer LR – VT4889. 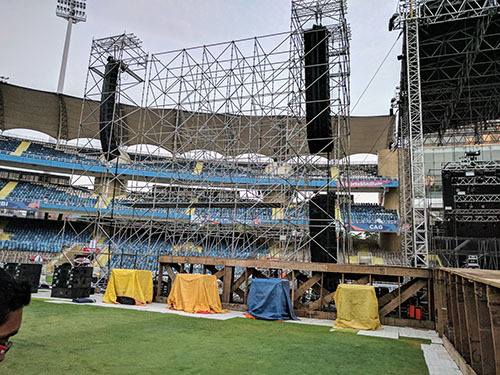 For the first time in India there was a side flown subwoofer rig to throw a lot of Bass into the stands and improved the low frequency extension right behind in the ground. The dynamic Lighting design for the show conceptualized by Nick Van Nostrand included fixtures from Martin Professional. Having the largest inventory of Martin Professional lighting in India, Star Dimensions – led by Ashish Mehta and Jay Mathuria took the baton of delivering the visual spectacle for the show. While acoustically the venue posed its set of challenges, the soaring temperature took its own toll on the crew and the power eating equipment especially lighting but the never say die spirit of the whole crew delivered a perfect show at the end! Martin Mac aura XB wash played a key role at the main stage, they were subtle yet impactful says Ashish and added “Nick Van Nostrand, the lighting designer had mostly worked with Martin Professional lighting on the purpose tour and was very happy with the fixture options we offered. It was a large set-up and Martin lighting fixtures worked flawlessly even in soaring temperatures.” The Martin Professional inventory used for the show included 136 Mac Aura XB, 40 Mac Quantum Wash, 36 Atomic 3000 LED. Commenting on the successful show, Prashant Govindan, Sr. Director Harman Professional India said, “It gives me immense pride in saying that we have broken all our previous benchmarks with the successful production of the show and added another feather to our crown. It is the dedication of our esteemed partners such as Sound.com and Star Dimensions, which never let them stop striving to outperform in their respective fields, and Harman Professional India is committed to support them in every execution”.